No driveways = no midblock turns = safer, smoother, greener streets. Here’s a small but effective way to solve one of the biggest problems with arterial streets. The small Dutch city of ‘s-Hertogenbosch (known as “Den Bosch” in approximately the same way that Los Angeles is known as L.A.) understands that when driveways open directly onto arterials, they create a mess of dangerous turns, conflicts with sidewalks and bike lanes, and needless pavement that could be used for precious urban greenery. Den Bosch’s solution wouldn’t work for every city, but it’s clever. The city has repurposed its old “service roads,” once used for milk deliveries and other slow-moving carriages in the 1920s, as one-lane access roads that double as low-stress bikeways. Paved in red stone, like the rest of the Dutch biking network, these service roads allow autos, but they can only be accessed from the end of each block. This means that the only autos using them are headed to the homes along each block, and their drivers seem happy to roll along at 10 mph for a hundred feet or so behind whatever bikes might be on the access road at the moment. 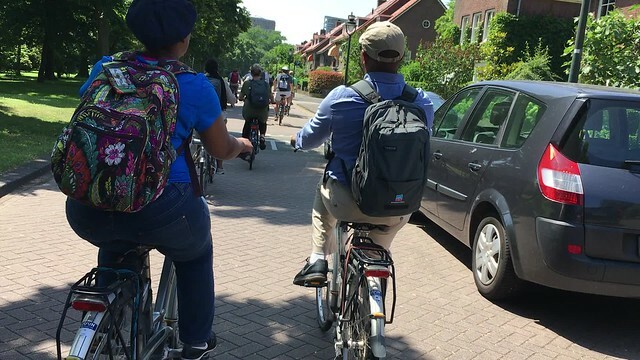 Like their American cousins, Dutch speed humps say “drive slowly and look around.” But unlike U.S. speed bumps, Dutch ones slope gently enough that they slip easily beneath the wheel of a bike, barely disrupting people pedaling over them. They’re about 3.5 inches high, sometimes flush with the curb at their peaks, and have a slope of something like 1:12. If you were building a street from scratch, an access road on either side might be too much space to consider. On the other hand, the right lane of many five-lane roads in the United States is essentially being used for this already, without the potential for it to double as a bike lane, and a car parking access area. But in Den Bosch’s case, it’s simply an example of what every city should be doing: thinking creatively about how to use the historical quirks of its streets to offer better mobility to its residents.